We supported Karen Millen unveil the next instalment in their 'Be More Karen' series for Spring/Summer 2018, which sees the focus shift to occasion wear with Karen Millen having all the styles covered for the key events in the calendar. 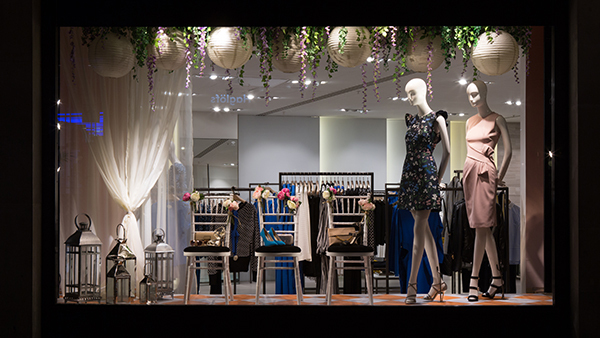 Karen Millen commissioned us to produce, deliver and install windows for the launch of their Hero 2 Campaign. We built a series of 3D arches which were inspired by a rustic villa setting, with rich foliage and floral expanses hung in a romantic and visually striking display The windows were rolled out to the global Karen Millen 60 store estate; we shipped the arches, foliage and other display collateral to all UK, USA and Europe locations for local store teams to complete the installations.